Radia's Dr. Pooja Voria discusses the new mammogram guidelines set by the FDA on King5 News. Click here to watch the segment and hear what this means for you. April 2019: Congratulations to our 2019 Seattle Magazine Top Docs! The results of the Radiology Business Top 100 are in and we are honored to be the largest 100% privately owned and operated Radiology practice in the nation! Click to read the full article here. Congratulations to the winners of the Seattle Met Magazine's 13th annual Top Doctor survey! Dr. Maria Chong, Dr. William Crenshaw, Dr. Sanjiv Parikh, and Dr. Uresh Patel were selected as Top Doctors for 2018. To learn more about the selection process or to see our doctors on the list, please visit Seattle Met Magazine. Want to learn more about kidney embolization? Check out the audio from a recent radio interview with Dr. Chuck Daly. The online edition of Seattle Magazine is live! Check out Dr. Maria Chong's feature and learn more about how the Top Doctors are chosen. Hundreds of doctors voted and the results are in, Radia is home to 7 of Seattle Magazine's 2018 Top Doctors. Congratulations to our winners and thank you to all the doctors who voted for us! It is our privilege to partner with many caring, wonderful doctors and to be able to provide imaging care to patients in the communities we serve. To read the entire list of winners, click here. MultiCare Valley Hospital and Radia's Dr. Randi Hart participate in a career day in hopes of encouraging more students to consider jobs in the medical field. It has been predicted that there may be a shortage of medical professionals in the next 5 to 10 years. This program hopes to show students some of the options they would have if they wish to enter the field of medicine. Click below to read the full article written by The Spokesman-Review. Radia President and CEO Dr. Bart Keogh accepts an award from WSRS President and Radia Radiologist Dr. Pooja Voria in response to our 100% Radiologist participation in both ACR and WSRS. Congratulations to all of our doctors on their commitment to “advance the practice, science and professions of radiological care”! To learn more about ACR click here, https://www.acr.org/About-ACR. Radia Inc., PS is proud to announce our recent mergers with South Sound Radiology (SSR) in Olympia WA and Columbia Imaging Group (CIG) in Vancouver WA. Through these mergers, Radia becomes the largest 100% physician owned and operated radiology group in the nation with 200 radiologists serving over 50 hospital and clinic partners. South Sound Radiology was formed in 1973 by two radiologists who had been providing services to the greater Olympia, WA area for over 20 years. The group of over 30 Radiologists serve hospitals across Southwestern Washington and owns and operates South Sound Radiology imaging center in Olympia, WA. Columbia Imaging Group was formed in 2004. The group of 17 Radiologists work closely with their hospital partner in Vancouver, WA to provide diagnostic and interventional radiology services to the Vancouver-Portland area. Radia has worked with both SSR and CIG for a number of years, sharing many of the same values, in particular, our collective practice shares a fundamental belief in the primacy of patient care and local community relationships. Today’s healthcare environment is constantly evolving, producing advancements and challenges. Through these partnerships Radia is re-committing to our local communities, strengthening our foundation and increasing our resources. We are getting bigger to get better. Radia Inc., PS was created in 1997 through a merger between Puget Sound Radiology and Radiology Associates, who had served communities throughout Western Washington since 1947. In addition to 200 Radiologists providing professional services to hospitals and clinics in Washington, Idaho and Alaska, Radia owns and operates two joint venture imaging centers and provides 3D post-processing services through the Radia 3D Lab. On Monday, November 6th, Spokane City Council, proclaimed November 8th, 2017 to be Spokane Day of Radiology. Radia's Somnath Prabhu, MD, spoke about the impact Radiology has in Eastern Washington and accepted the proclamation on behalf of the Washington State Radiological Society. October 2017: The Results are In! Click to read the full article ranking Radia at the top of the list in the Radiology Business Journal! Watch Radia's Dr. Rachel O'Connor, who was interviewed about "Mammo Night" an event hosted by Rockwood Breast Health Center to encourage women to have their annual screenings while having fun and getting pampered. Congratulations to Radia's Dr. Kara Carlson, who was published in a paper discussing the effect of tomosynthesis imaging as a function of age for breast cancer screenings. To read the full paper, please visit the link below. Evergreen Radia partners with EvergreenHealth to offer a clinical study opportunity for patients with Alzheimer's. 425 Magazine and King 5 News have both featured articles on the new opportunity, which is now accepting patients interested in participating in the national clinical research study on Alzheimer's. To read the article and learn more about the study, click here. Congratulations to our Radia Doctors for your 100% participation in both the American College of Radiology and the Washington State Radiology Society! Radia President and CEO, Dr. Bart Keogh accepts award from WSRS President Dr. Eric Stern. Dr. Pooja Voria is featured in two videos regarding breast density on King 5's new channel during Breast Cancer Awareness Month. She discusses the need for a dense breast law that would require radiologists to include information about a women's breast density in a letter they receive following their mammograms. This is currently a mandate in 27 other states. Radia ranks number 5 among the Top 100 Radiology practices in the United States! This is the ninth annual ranking of the 100 largest private radiology practices in the nation. The learn more about what's happening in the industry and to see the full list, click here. Radia's Dr. Rachel O'Connor is featured in a video about Rockwood Breast Health Center's 3D breast Tomosynthesis and breast cancer awareness month, which encourages women to get checked during the month of October. August 2016: Congratulations to the Three Radia Doctors Selected as Top Docs by Seattle Met! Congratulations to Dr. Frantz Pierre-Jerome, Dr. Sanjiv Parikh, and Dr. William Crenshaw on being selected by Seattle Met as Top Doctors in 2016! This is their 11th annual list of the best health practitioners in the Seattle area. To learn more about the selection process, how our doctors made the list, and to see other health care practitioners in your area, please visit Seattle Met. Radia would like to congratulate our partner hospitals, Swedish Medical Center, Evergreen Health, Providence Medical Center and Overlake Hospital on being recognized by US News and World Report as some of the Top 10 Hospitals in Washington State! March 2016: Radia Inc. Receives 2016 Best of Kirkland Award! Radia Inc. was selected to receive the 2016 Best of Kirkland Award. February 2016: Eight Radia Doctors Were Selected as Top Docs in Seattle Magazine! Congratulations to Dr. Maria Chong, Dr. Virginia Eschbach, Dr. Bart Keogh, Dr. Lloyd Stambaugh, Dr. John Clemett, Dr. William Crenshaw, Dr. Frantz Pierre-Jerome, and Dr. Mark Zobel on being selected by their peers as Top Doctors in 2016 Seattle Magazine's annual list of the best physicians in the Puget Sound Region! To learn more about how our providers were chosen, or to see the entire list of Top Doctors in the area, visit Seattle Magazine's website. December 2015: The Herald Highlights the Importance of Scheduling a Mammogram. The Washington Herald published an article highlighting Radia's Dr. Sally Browning and stressing the importance of scheduling regular mammograms. Dr. Browning is quoted throughout the article, and give some good advice to patients wondering when and how often they need to be checked. Radia was proud to host Congressman Rick Larsen (D) at our corporate office in Lynnwood, WA. Congressman Larsen represents the Second Congressional District of Washington state, which includes portions of Snohomish, Skagit and Whatcom counties and all of Island and San Juan counties. He toured our facility and spoke with CEO/President, Bart Keogh, MD, PhD and Lisa West, COO as well as several staff members about the changes in healthcare both in our state and across the nation and how imaging and Radia contribute to the care of patients in the communities we serve. Thank you Congressman Larsen for taking time out of your busy schedule to visit us! August 2015: Radia Breast Imager, Dr. Moira O'Riordan featured in breast tumor treatment article. Radia Breast Imager, Dr. Moria O'Riordan, is featured in an article about a new breast tumor treatment that can solve benign tumors. To read the article and learn more about this treatment, visit The Spokesman-Review page here. August 2015: Radia is home to 3 Top Doctors this year! Radia is proud to have three of the Doctors selected as Top Doctors by Seattle Magazine and Seattle Met in 2015! Our three Doctors were awarded spots by both the publications through a peer-nominated selection process. Maria Chong, MD, Sanjiv Parikh, MD, and Lloyd Stambaugh, MD, were chosen to represent the best in their field of radiology. To learn more about how our providers were chosen, or to find a Top Doc in your area, visit the Seattle Met website or Seattle Magazine's website. Radia's partner site, Rockwood Health System, has launched a new neuroscience institute comprising 25 providers. The Journal of Business published an article highlighting the new multispecialty neurology care center located in Spokane, WA. The Rockwood Neurosciences Institute opened a few months ago and will be a one-stop care center for patients with neurological disorders. To learn more about the new institute and read the article, click here. Dr. Justin Smith was recently honored by Valley Hospital Medical Center. He was nominated for the award by the staff of the Interventional Radiology suite and presented with the Physician of the Quarter award last month. Congratulations Dr. Smith! Congratulations to Dr. Bart Keogh and the Swedish Neuroscience Institute on their participation in this amazing study! May 8, 2015: Radia Inc., PS and the Greater Spokane Incorporated partner up. Radia Inc., PS is proud to be a new member of the Greater Spokane Incorporated! October 15, 2014: Dr. Rachel O'Connor Featured on 92.9 ZZU's Morning Show. Dr. Rachel O'Connor, breast imager, was featured on 92.9 ZZU's morning show this morning. She was invited by morning DJ Molly to talk about breast health, the Rockwood Valley Breast Health Center and October Breast Cancer Awareness month events. To learn more about the Rockwood Valley Breast Health Center, please click here. To find a Breast Center location near you and schedule a mammogram where a Radia doctor works, please visit our Breast Centers page here. 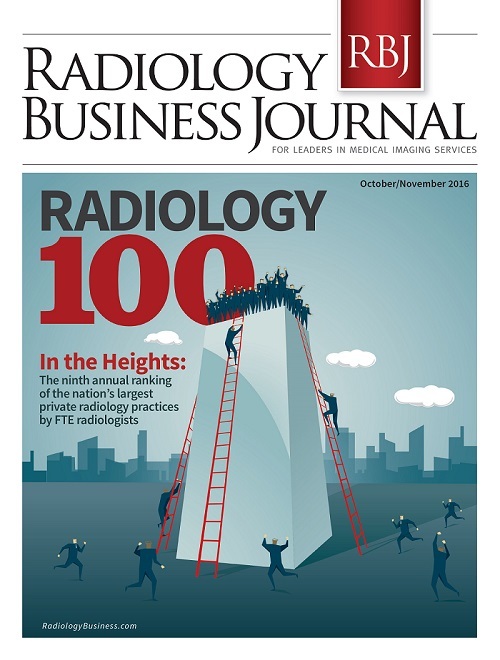 Radia was recently recognized in the Radiology Business Journals article, Radiology 100: Big is Beautiful, which features the top 100 radiology practices in the country. This is the 7th year Radiology Business Journal has surveyed the industry and put together these rankings. The article highlights the growing industry and some of the opportunities and threats that these large companies face. To read the article and see how Radia ranked, click here. Radia's Dr. Kara Carlson goes on King 5 News to discuss how the new 3D mammograms are changing the way we detect breast cancer and allowing doctors to catch it earlier. To see Dr. Carlson's interview and learn more about the 3D mammograms and why getting tested is so important, click here. Dr. Sanjiv Parikh and Dr. Ben Babusis were honored to be invited to speak at the recent AHRA meeting in Issaquah, WA to a group of over 50 regional imaging leaders. September 2014: Radia Doc involved in Snohomish County American Cancer Society Night of Hope Gala. Dr. Eschbach has been a big supporter of the American Cancer Society event throughout its five years and has donated her time, money, and creativity to the enhancement of the event each year. Thank you Dr. Eschback for giving back to the community and making us proud! September 10, 2014: Radia President and CEO invloved in MS Study. Radia President and CEO, Bart Keogh, involved in MS study published by the RSNA. To read the press release and learn more about the study, click here. Congratulations to Dr. Kara Carlson, Dr. Maria Chong, Dr. Geoffrey Ferguson, Dr. Christopher Krol, Dr. Vivek Manchanda, Dr. Juan Millan, Dr. Sanjiv Parikh, Dr. Mohammed Quraishi, Dr. Lloyd Stambaugh, and Dr. David Westman on being voted by their peers as Top Docs for 2014 in Seattle Magazine and Seattle Met! Seattle Magazine's 14th annual Top Doctors list is the result of more than 13,000 nominations gathered through a comprehensive peer-to-peer survey process (Learn more about their process here) Seattle Met's annual Top Doctors rankings are done in a similar way with 7,000 survey based nominations, and the top docs being chosen by an anonymous advisory panel (Learn more about their process here). May 2014: Brian C. Tryon, MD, A Man of Many Interests! Our Doctors have many talents! Congratulations to Dr. Tryon who was featured on the cover of The Message magazine highlighting his working ranch! February 11, 2013: Radia Home to Four Top Docs! Radia is proud to be home to FOUR of U.S. News and World Report's Top Doctors for 2013! Through a peer-nominated process Art Castagno, MD, Maria Chong, MD, Bart Keogh, MD, and Pedro Vieco, MD were chosen as representatives of excellence in medical care in the field of radiology. For more information on how our providers were chosen, and to find a Top Doc in your area, visit U.S. News & World Report's website. Dr. Mark Wilson and Dr. Travis Stratford, Radia Interventional Radiologists, were recently honored by Valley Hospital Medical Center. The two IR physicians were presented awards for Physician of the Quarter by hospital CEO Dennis Barts, who was effusive in his praise of the services both doctors continue to provide. They were nominated for the award by the staff of the Interventional Radiology suite after the hospital experienced its busiest month ever for IR in May. Stratford and Wilson performed 113 cases this month, a marked increase from just two years ago when May 2010 saw only 35 exams performed. Congratulations, Dr. Stratford and Dr. Wilson! March 12, 2012 - Dr. Keogh on Anderson Cooper Live!